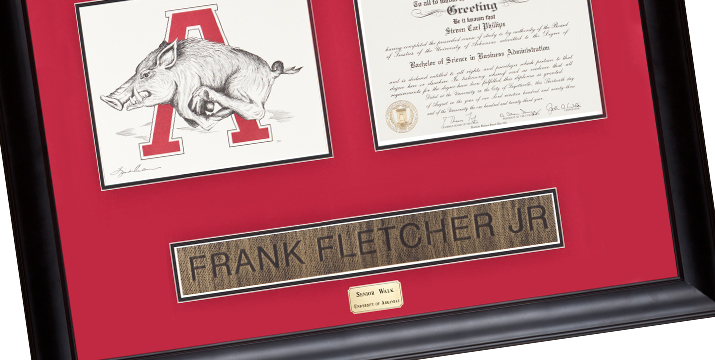 Whether you’ve spent just one year or a lifetime on The Hill, you will forever be part of the Razorback family. ForeverRed provides unique and personalized products that allow you to take the memories with you, wherever you go. And, we’re not just any business. ForeverRed is powered by SAKE: Students Acquiring Knowledge through Enterprise. ForeverRed is a 100% student-run business on the University of Arkansas campus. From developing new products to fulfilling orders, students do everything. When you buy a ForeverRed product, you are shaping the next generation of U of A business students. It was okay. As someone who doesn’t like peanut butter or gum, those aspects were a little disappointing but overall it’s a good idea. I was so please when I received my framed diploma. The rubbing of the sidewalk makes it even more personal. We are very happy with the frame, rubbing, and picture, thank you! Unique and meaningful gift for my father - one that brings back pleasant memories of time spent at the University!